Two posts in one day! Whoa nellie! But this is very interesting. Hi Jen, love the blog! Listen, I wanted to seek your opinion in continuance of your website recommendations....I'm an intermediate adult flutist and I'm looking for a Muramatsu flute.I adore the heavy wall sound, but cannot afford a DS/GS model. I tried Miyazawa heavy wall once and liked the action, but it was out of my price range.Do you know which of the older used models from the either company would have a darker tone? Currently, I play a 1989 Artley nickel plated. However, the mechanism is choppy, stiff, and clumsy despite many reputable flute shops looking after it. Is the nickel giving me a darker sound quality that I like? Should I go for an "Old Scale" Standard? Would solid silver make the quality brighter as tonguing is my greatest limitation in playing? Should I go for a nickel plated silver? Basically, I'm trying to figure out the best way to simulate heavy wall sound, but not kill off what little articulation that I have. I bought a 14K Aurumite headjoint and it is amazing, but the Artley can't keep up with the action. I would really like to find a darker flute (C ft) with great action to match it. My instructors have said that the B foot is darker, but I "hear" C foot as darker when I compare my flute to B models head to head. 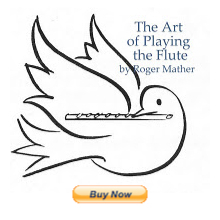 The fact is that no two flutes play alike, and until there is an exacting replication technology, where a given flute is utterly replicated in various different materials, this will continue to be the case. If you travel to a flute store where all the flutes are in excellent repair (no pad leaks) and play-test try 10 identical flutes in a row with sequential serial numbers you will be unlikely to find two that sound identical or even feel the same. Always there will be some that feel or sound darker or lighter than others. Also, older flutes with out of tune scales (sharp C#s, flat low registers etc.) make more work for the intermediate player. That times spent humouring the old scale flutes into tune could be spent on developing tone colour options instead of just trying to play to pitch. So avoid old-scale flutes if you can. Now, to the real question which is about the human perception of "light vs dark" in flute tones. The debate about bright vs. dark tone has been going on for at least a century, and possibly several centuries. Nancy Toff writes on this in her book "The Flute and Flute Playing". Note: to read the above jpeg, click on it to enlarge, and use back button to return. Nancy Toff's book on google books: see page 96 and 97. The data and graphs (of sound spectrums of heavy wall and normal wall flutes) showed no directional correlation between a change in flute wall thickness and the relative amplitudes of the harmonics, suggesting that flute wall thickness does not affect the timbre of the tone produced. The outcomes of the trials also suggest the flute timbre varies slightly among flutes of the same thickness. This conclusion indicates that timbre of the flutes cannot be exactly reproduced, even under uniform conditions. Although harmonic amplitude was not affected, there was a slight, but definite change in the frequencies of the harmonics. It can be concluded that as flute wall thickness increases, the frequencies of the fundamental, second, and third harmonic also increase. As stated in the data analysis, an explanation of the increased frequencies is probably due to a decrease in the volume of air inside each flute. Article on listener's expertise on pitch and tone colour. It seems that years of experience and listening improves ones ability to discern finer and finer degrees of tone colour. The mistake here, according to scientists, is thinking that the vibrating instrument is what is producing the sound. Basic acoustics tells us that the woodwind instrument is merely a container for the real sound-producing body—a vibrating column of air. So I'm really glad you asked the age-old question about dark vs. light flute tone, because I wouldn't have found all these cool resources (especially the great dissertation paper above!) if I hadn't been spurred onto it. My advice to you would be to buy a mechanically reliable flute with a good scale. I tend to recommend Azumi 3000 (under $2000) but would need to know your budget limitations if shopping used instruments. If you're shopping as an "investment" in your future, for about $2500-$3500 you could likely find a used Sankyo Silver Sonic, if in very good repair, which I also think is excellent and capable of being played quite easily with a "darker" sound. But as a developing player, you'll want to choose all kinds of tone colours, and I believe that a better quality flute will likely give you that choice. But remember, a darker sound can be created to a certain extent on most headjoints, simply by blowing more downward in angle. I tried to imitate the sound samples you sent me here by playing your mp3 over my computer speakers, and then immediately imitating them and setting the sounds side by side. I finished the sound sample with a bit of a William Bennett performance. Now there's a great mixture of dark and light! Have a listen to a 2 minute sample of this here. (press the play button when you arrive.) The William Bennett snippet is right at the end. Fun eh? Matching the dark tone of your Artley with my Altus. This is a skill which I fool about with often, for example Fluteloops show online with the imitation of 16 of James Galway's flutes. You may have to adjust your chin placement, lip angles or air angle to find the limits of bright and dark on a single headjoint, so the best is to experiment with the full span of tone colours available. Meanwhile, go flute shopping within your budget, and get a mechanically able flute. I'm firmly of the opinion that you can make any flute sound "dark" by altering the embouchure, or changing the headjoint, as over 95% of the tone is created by the splitting edge and the resonance at the splitting edge, and not by the body of the flute. Good luck in your search, and go for a reliable, fast mechanism with a good scale, and then darken your tone using embouchure exercises; that would be my advice. It gives you more options of constant tone development. This is great info, but I have another question, that I think might be related. And that is the quality of sound in terms of edginess. How does that fall into tone quality? I kind of think it as related, but am unsure. I play with a really edgy sound - but I think its only audible in the low register. For example, I play in a flute choir that has about 30 players. And when I am on part 5 or 6 the director often tells me "less edge" so that "blend in with the others" I kind of always thought it (edgy) sounded more focused, less muddy. when I lessen the edge, it is more rounded, and almost more wooden sound. Does that make sense? I strive for an edgy sound with a round tone. But I wonder, is this a matter of taste or preference? I think that "edge" is a spice like chili peppers are a spice. Perfect for certin cuisines (or perfect for certain spots in a piece of music that's suitable) but fatiguing to the ear if done all the time. You understand exactly, I'm sure. I am also an intermediate adult flutist and love dark flute tones and have been craving a heavy wall Muramatsu DS since I started playing. Now the opportunity has come up to buy one and I need to decide If i want a b foot or c foot. I currently play a b foot sankyo 401 which has a lovely bright even sound across all registers, but i prefer a darker tone. My main concern with buying a b foot DS is wether it will be too heavy for me. I'm tiny and have recently started developing left arm pain from over-fluting!I have only tried a c foot heavy wall before and that was pretty heavy. Please can you tell me the advantages of b foot vs c foot (apart from being able to play low b and being really heavy)!? I keep hearing different things about high notes being easier on b foot -is this true? I know b foot is supposed to make the tone more resonant and richer but presumably the sound on a heavy wall will already be rich even with a c foot. Going mad with indecision...thank you for any advice you have! In my opinion the heavy wall flute will increase any problems you're having with left arm pain. There's no way it cannot. The weight of a heavy flute for a small person will always be a problem. You can get a darker sound by changing the headjoint. I honestly don't believe that a heavy wall flute makes the sound darker by the thickness of the walls of the flute. It's likely only the headjoint that makes a huge tone difference. The walls contribute less than 1%. Have you fully explored getting the darkest possible sounds out of your Sankyo?